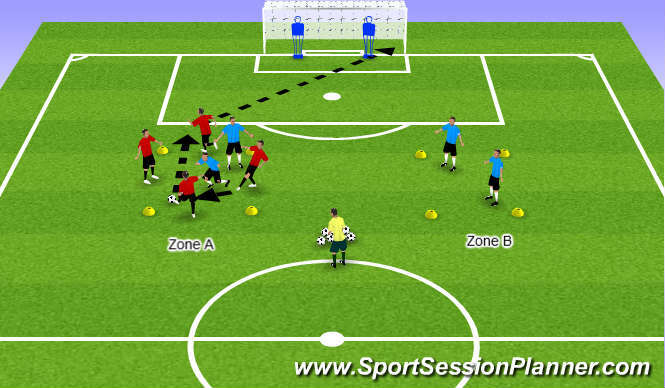 Play starts with the Coach playing the ball into either Zone A and two players from the opposite Zone B transition into defending against the four attackers in Zone B. Play should always start with the coach after a shot on goal or if the defending/attacking loses control of the ball (not possession). If the defenders win possession, they must play a pass back into their zone before a pass can release any defending player transitioning into attack. The attackers who lost possession can only prevent the pass inside the opponents zone. Once the pass has been played no player can defend outside either zone. If using a GK, s/he must stay inside the 6yd box until the penetrating pass is made and then move accordingly. 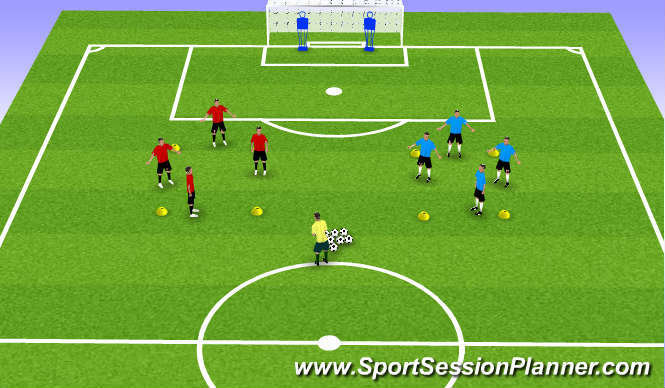 S/he can attack the goal if a penetrating pass can be made between the defenders to run onto. Bend the shot into the far corner. Weight of pass to be accurate enough to be just in front of the attacker...don&apos;t break their stride.